Have you dreamed of traveling to the lovely Caribbean island of St Lucia? Active boomer travelers will find plenty to do. Today, My Itchy Travel Feet guest writer, Brette Sember, shows us how to have fun with mud, chocolate and sand on an active afternoon in St Lucia. Updated 02.01.2019: Whether you come to St Lucia by cruise ship or to stay on the island, you’ll find plenty of things to do. In just one afternoon my family and I experienced some of the best of what the island has to offer. We rented a car, but excursions or drivers can also be arranged. 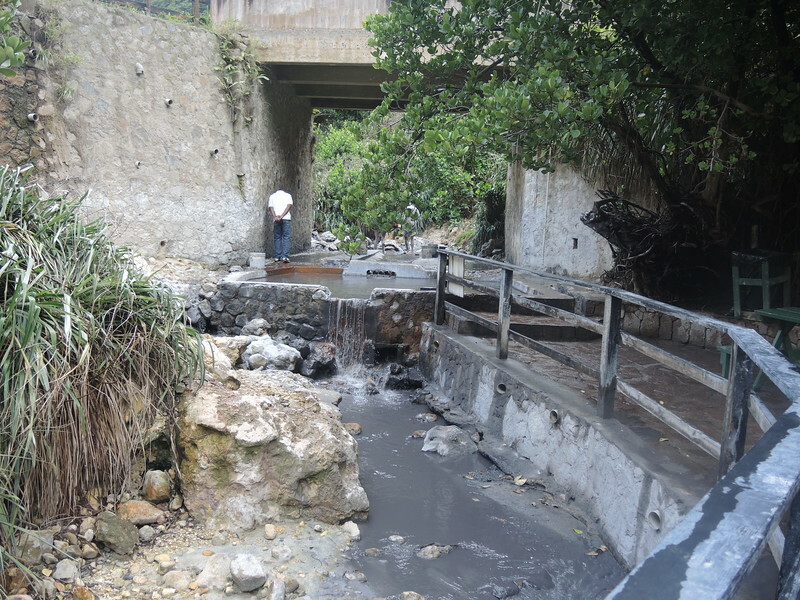 Playing in the mud at Soufriere Springs. The day started off down and dirty. St Lucia has what they call a drive-in volcano at Soufriere Springs. You can’t actually drive all the way in, but you can park and walk in to see steaming sulphureous holes. For a more unique experience, skip the steam and head to the mud bath. Wear a bathing suit—leave all your jewelry at the hotel or on the ship—bring a towel, a plastic bag for your wet things, and a change of clothes. The mud bath is next to the entrance booth. You’ll leave your clothes on a picnic table and be helped down into a very muddy square concrete pool filled with warm water. Taking a mud bath in St Lucia. Once you’re wet, you’ll climb out the other side and stand in a trickling stream while friendly attendants bring over a bucket of fresh sulphur mud and madly begin smearing it all over your legs and arms. Fortunately, they then let you cover the rest of your body yourself and helpfully take a photo with your camera. You go back into the pool and rub the mud off and relax. When you emerge, your skin feels incredibly soft, but the price for silky skin is that you stink of sulphur. Head directly to the outdoor (cold!) showers! There are dark little changing rooms where you can dress. Don’t be alarmed if one of the mud attendants says “pssst” and clandestinely holds up a bag of mud for you to buy (we politely passed). Learning to make chocolate bars in St Lucia. Once you’re cleaned up, the adventure continues. About 5 minutes away from the volcano is Hotel Chocolat, an expensive resort with a stunning view of the Pitons, the twin peaks that are the best known symbol of the island. The hotel offers an hour-long tree to bar chocolate experience (email them to book before leaving home). Make my own chocolate bar? I said yes to that. Our guide (who told us his name was Cutthroat) led us to a shady covered porch on a plantation-style building in the middle of the trees. He shared the fresh cacao fruit (grown on the property) with us. When he cut it open it revealed pure white flesh and big seeds. The inside pulp of the fruit is incredibly tasty: fruity, light, sweet, and nothing at all like chocolate. It was delectable to sample. 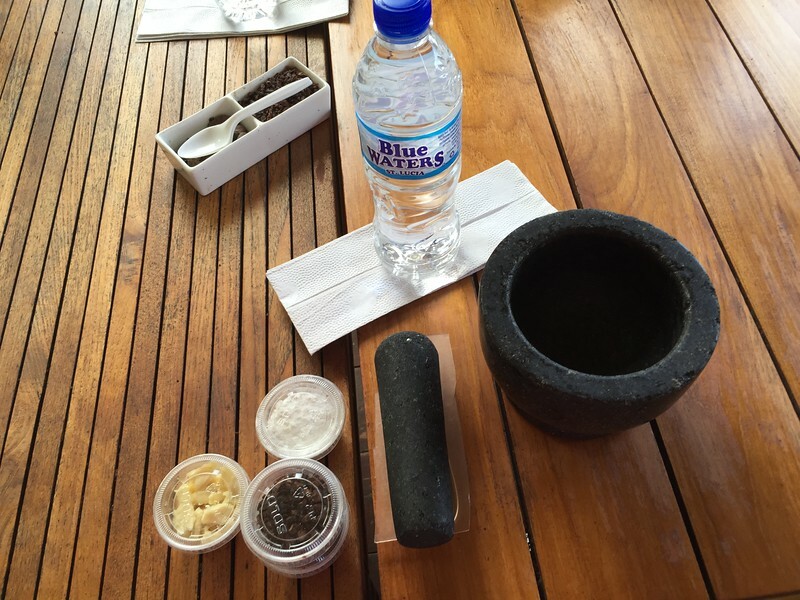 To make your chocolate you take roasted cacao nibs (the dried seeds) and cocoa butter (extracted from the seeds) and work them together in a hot mortar and pestle. It’s hard work! The chocolate slowly becomes molten and you add sugar and then pour it into a mold. After the chocolate cools, it’s yours to take home. The fun is in making the bar; the end result doesn’t compete with commercial chocolate. However sampling the cacao nibs and the molten chocolate as you work will definitely fulfill your cravings. You can taste the chocolate influence in every item at Boucan, Hotel Chocolat’s restaurant. While you’re waiting for your bar to set, enjoy lunch at Boucan, the resort restaurant situated in the trees. 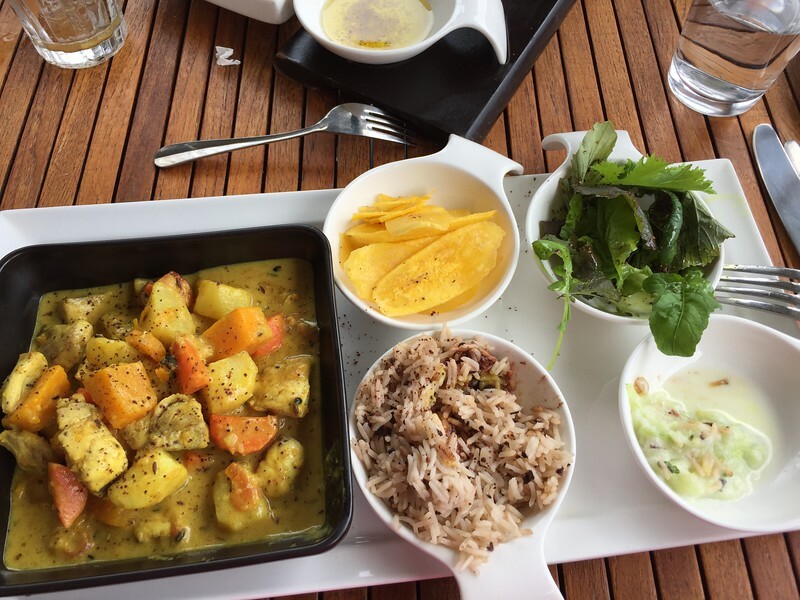 Every item on the menu incorporates chocolate in some form (there is even chocolate butter for your bread, chocolate in the salads, and cacao tea). Pure heaven for chocolate lovers. Ending an active afternoon in St Lucia by relaxing at the beach. After you’ve fed your inner chocolate monster, head to the beach. Every beach in St Lucia is open to the public, even if it is part of a resort. The resorts don’t want you to know this and may try to discourage visitors, but cannot keep you out. They must allow you to park on the property and access the beach. Sugar Bay Beach Resort was where we headed, a 10 minute drive from Hotel Chocolat. We parked in visitor parking. The owner of our resort in Castries instructed us to tell the guards we were dining in the resort and that they would then let us in. They drove us in a golf cart down to the beach where we enjoyed some time on the sand and in the water. 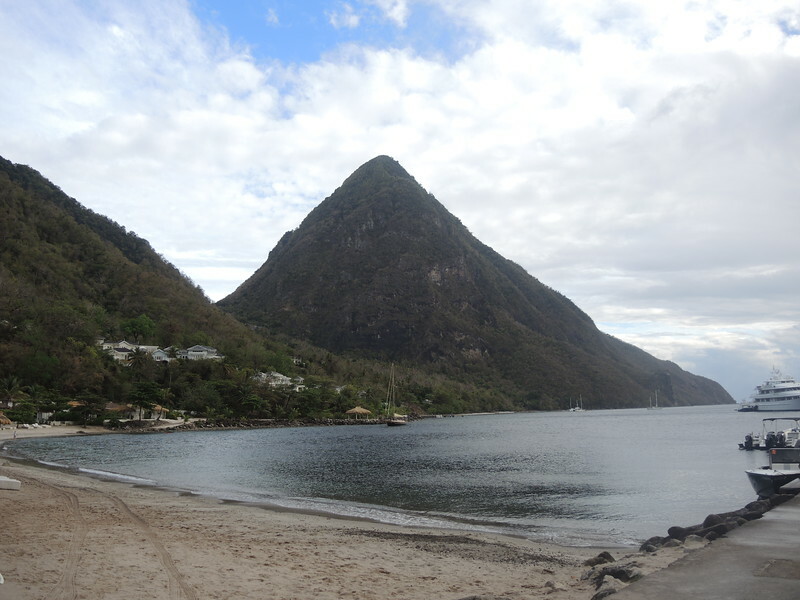 This is the perfect beach: nestled between the towering Pitons with soft sand and clear water. It was a relaxing end to a day of adventures on the island. An afternoon in St. Lucia satisfied my cravings for adventure, chocolate, and relaxation all in the space of a few hours.